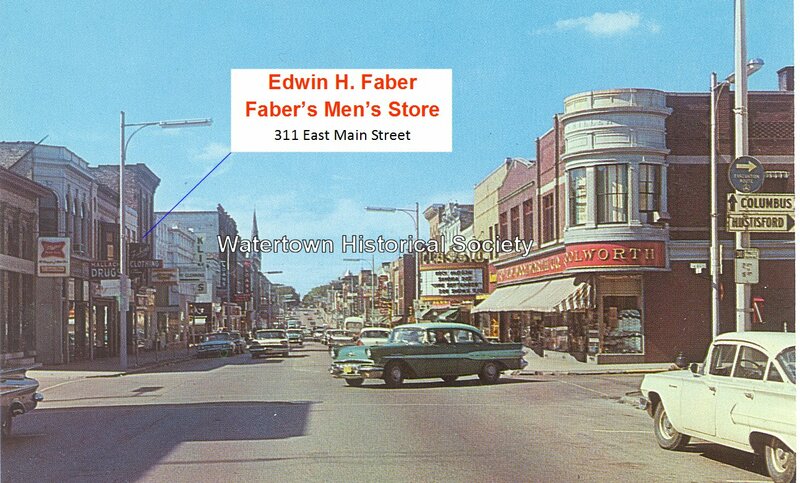 The long career of Edwin Faber, Sr., Watertown businessman for over 63 years, will come to an end this month when Faber’s Men’s Store, 311 East Main Street, closes its doors. Mr. Faber, who will celebrate his 95th birthday on Dec. 7, is still active in the business and comes to the store each afternoon to assist his son and daughter-in-law, Mr. and Mrs. Edwin C. Faber, who now operate the store. Faber’s is presently in the midst of a going-out-of- business sale and plans call for the final closing of the store later this month. Mr. Faber said he will continue to be active in a variety of areas at home and will also get around to other places after his retirement because “I am a firm believer that the mind controls the body.” He added if one can keep his mind active, his body will be taken care of by the mind. He said by keeping the mind active, everything will be OK.
Mr. Faber was born in Olewein, Iowa on Dec. 7, 1877. The first job he held was that of a cutter in Milwaukee in 1900. At that time he helped make clothing for the wealthy persons in Milwaukee. His first employment in Watertown was with the firm of Schliffler and Wegemann which was located at Third and Main streets, the location of Salick’s today . The name was changed to Wegemann and Weber several years later and then in 1906 he organized his own store at its present location. That store was known as Wegemann, Faber and Kaercher. 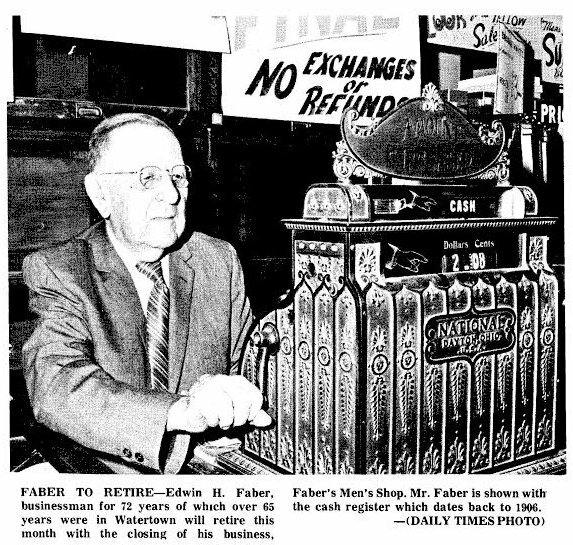 In his earlier business life, Mr. Faber was active in many community affairs. One of his interests was the Elk’s Lodge where he participated in many phases of the club’s work. He was treasurer of the club. He is a former member of the board of directors of the Wisconsin National Bank. 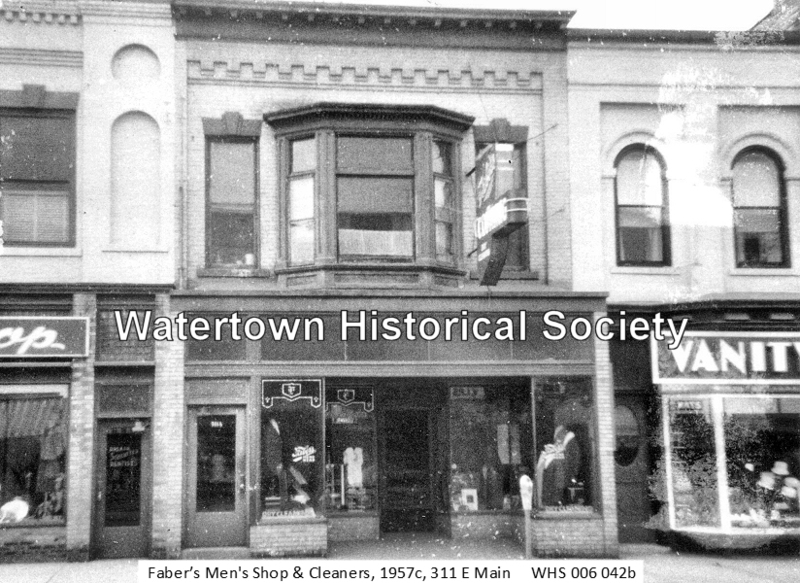 Mr. Faber was one of the organizers of the old Watertown Businessmen’s Association. On the occasion of his 90th birthday Mr. Faber was presented with a plaque by the Watertown Area Chamber of Commerce in appreciation for the many activities in which he participated. The plaque noted he was Watertown’s oldest downtown merchant. Over the years he was treasurer of the Watertown Canning Company and the Watertown Wholesale Grocery Company. After the Faber store is closed, the old fixtures will be sent to Denver, Colo., where the store will be re-created to appear like one from the turn of the century, Mr. Faber said. Mr. Faber takes pride in the cash register used by the store. The register, made by National Cash Register of Dayton, Ohio, was delivered to the store on Feb. 5, 1906 and “operates as good today as it did then.” He said it is one of only approximately 40 all-brass hand tooled cash registers made. The rest were made by mass production. Already several persons have made requests to purchase the register as an antique but Mr. Faber has not decided where it will go.